Gina Cheri Haspel (born October 1, 1956) is an American intelligence officer. Haspel is the 7th and current Director of the Central Intelligence Agency since May 21, 2018 appointed by President Donald Trump. Before, she was the 6th Deputy Director of the CIA, appointed by Trump in February 2017. On March 13, 2018, Haspel was nominated by President Trump to become the CIA Director, replacing Mike Pompeo. She is the first woman to hold the position. She was approved for confirmation by the Senate Intelligence Committee on May 16 by a 10-5 vote, with two Democrats voting in favor. She was sworn-in on May 21. Haspel was born Gina Cheri Walker on October 1, 1956 in Ashland, Kentucky. 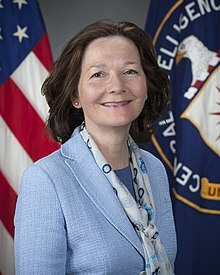 Haspel was a student at the University of Kentucky for three years and transferred for her senior year to the University of Louisville, where she graduated in May 1978. Haspel joined the CIA in January 1985 as a reports officer. She held many undercover overseas positions, for many of which she was station chief. Her first field assignment was from 1987–1989 in Ethiopia, Central Eurasia, Turkey, followed by several assignments in Europe and Central Eurasia from 1990 to 2001. From 1996 to 1998, Haspel was station chief in Baku, Azerbaijan. On February 2, 2017, President Donald Trump appointed Haspel Deputy Director of the CIA. On February 8, 2017, many members of the Senate intelligence committee asked Trump to change his appointment of Haspel as Deputy Director. On March 13, 2018, President Donald Trump announced he would nominate Haspel to be the Director of the Central Intelligence Agency, replacing Mike Pompeo who was set to become the new United States Secretary of State. Haspel became the first woman to become permanent Director of the CIA. Many people were against her nomination because of her support of torture and water boarding. Haspel was approved for confirmation by the Senate Intelligence Committee on May 16 by a 10–5 vote, with two Democrats voting in favor. The next day, Haspel was confirmed by the full Senate, on a mostly party-line, 54–45 vote. Haspel married Jeff Haspel in 1976. They were divorced by 1985. Haspel lives in Ashburn, Virginia. ↑ "Gina Haspel Selected to be Deputy Director of CIA". Central Intelligence Agency. February 2, 2017. Archived from the original on 2017-02-03. Retrieved February 2, 2017. Ms. Haspel is the first female career CIA officer to be named Deputy Director. ↑ "Who Is Gina Haspel, President Trump's Pick for CIA Director?". TIME. March 13, 2018. ↑ Herb, Jeremy (May 16, 2018). "Committee approves Trump's CIA director nominee, setting up full Senate vote". CNN. Retrieved May 16, 2018. ↑ 4.0 4.1 "CIA chief Gina Haspel faces a grilling". The Australian. March 18, 2018. Even the most basic facts about Ms Haspel's life are hard to establish. She was born Gina Cherie [sic] Walker in Kentucky in 1956. At 20, she married Jeff Haspel, an army officer, but they were divorced by the time she joined the CIA in 1985 as a reports officer, specialising in Russia. By 1988, she was listed as "acting head of administration" at the US embassy in Addis Ababa. ... Her subsequent postings remain classified but she was based in Ankara in 2003 and was CIA station chief in New York. ↑ "Haspel's nomination questionnaire" (PDF). Senate Intelligence Committee. Retrieved May 9, 2018. ↑ Youssef, Nancy A. (March 22, 2018). "CIA Fills In Some Blanks on Gina Haspel's Secret Life". The Wall Street Journal. Archived from the original on March 22, 2018. Retrieved March 22, 2018. (Subscription required (help)). She became a spy before the internet age and remained in that secret life for three decades, leaving behind no digital profile. [...] So it falls to the agency to share something about her and her interests. ↑ "Get to Know our Deputy Director". CIA. March 23, 2018. Retrieved April 27, 2018. ↑ 8.0 8.1 8.2 Gazis, Olivia (May 1, 2018). "CIA Director nominee Gina Haspel: CIA releases timeline of her clandestine career". CBS News. Retrieved May 1, 2018. ↑ "Gina Haspel". Central Intelligence Agency. Archived from the original on March 14, 2018. Retrieved March 13, 2018. ↑ Stein, Jeff (March 13, 2018). "Trump's new CIA Director Nominee embraced Waterboarding, but Torture not likely to return at the Agency". Newsweek. Retrieved March 27, 2018. ↑ Goldman, Adam (March 13, 2018). "Gina Haspel, Trump's Choice for C.I.A., Played Role in Torture Program". The New York Times. Retrieved March 14, 2018. ↑ Johnson, Tim (February 2, 2017). "New CIA deputy director is 1st career female officer in the post". Miami Herald. Retrieved March 13, 2018. ↑ Vitali, Ali; Mitchell, Andrea (March 13, 2018). "Trump fires Rex Tillerson, selects Mike Pompeo as new Secretary of State". NBC News. Retrieved March 17, 2018. ↑ Press, Associated (March 13, 2018). "Gina Haspel named by Trump to be CIA director, replacing Pompeo, who will replace Tillerson at State". The Washington Post. Associated Press. Retrieved March 13, 2018. ↑ Greenwald, Glenn (May 8, 2018). "Will Democrats Unite to Block Trump's Torturer, Gina Haspel, as CIA Chief? If Not, What Do They #Resist?". The Intercept. Retrieved May 15, 2018. ↑ Rizzo, Jennifer (April 9, 2018). "Former intelligence heavyweights endorse Trump's CIA pick". CNN. Retrieved May 15, 2018. ↑ Fandos, Nicholas (May 17, 2018). "Senate Confirms Gina Haspel to Lead C.I.A. Despite Torture Concerns". The New York Times. Retrieved May 19, 2018. ↑ Manson, Katrina (March 16, 2018). "Gina Haspel, the undercover spy picked to head the CIA". Financial Times. Retrieved March 22, 2018. ↑ "Trump Names Gina Cheri Haspel to Head CIA". Newsmax. Associated Press. Retrieved May 8, 2018. This page was last changed on 24 July 2018, at 01:13.